The global law sector is facing a period of transition. Traditional bricks-and-mortar firms are struggling to cope with an incoming wave of alternative business models, and top fee-earners are either sinking or swimming based upon their ability to embrace technological advances in the field. The demand for law services isn’t expanding as quickly as supply in many international markets, and, as a result, many firms are finding it increasingly difficult to retain talent. The UK’s 50 largest law firms achieved a sixth consecutive year of revenue growth in 2015-16. According to Legal Week: “Together, the 50 firms brought in a total of £18.24bn [$23bn], up from £17.45bn [$22bn] in 2014-15 – an increase of 4.5 percent.” While the UK market is not the be-all-and-end-all for the legal industry, it does suggest resilience worldwide. The UK is currently at the forefront of political and economic uncertainty following its vote to leave the EU in June. From Austria to Italy, the US to the Philippines, similar electoral upsets have caused disruption to the way companies are conducting business. If the UK’s legal industry can weather the storm, other regions should also be optimistic. While many smaller firms have crumbled under the weight of big-name paralegal debutantes, it was the dynamic firms – the ones that addressed the key issues facing the industry head-on – that achieved undeniable success. Firms are finally capturing a degree of scale through consolidation, and they are embracing new, cutting-edge IT systems, which are in turn revolutionising an industry that has largely gone unchanged for two centuries. If the sector continues to respond favourably to such changes, it will be a tremendously exciting time for the global law industry. Despite economic uncertainty and financial anxiety, the world economy is broadly performing well. The US has maintained strong growth, driving the wider economy. As a result, global firms – particularly those in the US – have witnessed a considerable spike in business. But because of the intensive financial constraints and activity restrictions being placed upon international businesses, in-house legal teams have taken a major beating. General counsels have been forced to shed jobs left, right and centre, opening up the door for professional law firms to take on contractual work that companies no longer have the time or resources to complete. The post-recession era is one of tightening regulation, particularly for financial services. Increasing regulation and compliance oversight surrounding life-or-death facilities, such as financial reporting, has meant European firms need more legal advice than ever before. And for this, they are willing to pay. One way firms successfully trimmed costs in 2016 was by developing a lower and more variable cost base aligned to the activity levels of various clients. Yet by and large, global firms have mostly been able to drive profitability through an increased reliance on paralegals. So-called ‘non-solicitor lawyers’ are taking on more work than ever before, and over the course of the last year their role in the sector has continued to evolve. Paralegal firms cost less, and the typical billing rates prove an invaluable saving against the valuable time of costly fee earners. In cases where more stringent legal credentials are required, European firms have begun subcontracting an unprecedented amount of work to regional bases. Legal process outsourcing companies have also exploded across southeast Asia, and have earned a sterling reputation over the past couple of years for their ability to take on commoditised matters more efficiently than many domestic firms because of their highly systemised (and often automated) frameworks. Lateral hires have continued to increase in the legal industry. According to the Legal Executive Institute: “Since 2010, lateral partner moves have increased by 36 percent, and in 2014 — the biggest year for partner hiring since the recession — more than 50 lateral partners were hired each week by AmLaw 200 firms.” In particular, US firms are carrying out lateral hires in London. Meanwhile, firms are investing more than ever in traineeships in order to foster young talent and capitalise on a degree of corporate allegiance. A vast majority of opportunities are still created at international partner firms and regional bases in a bid to cater to young hires keen on habitual changes of scenery. In order to make those traineeship programmes bear fruit, global firms have become utterly reliant upon establishing new relationships. In recent times, dozens of non-sector firms have taken their first sorties into the global law sector. Using alternative business models, insurance giants, TV loan companies and even high street banks have introduced a range of new legal services to compete with old-fashioned, bricks-and-mortar law firms. Some smaller firms are experiencing huge losses in ordinarily reliable revenue streams like conveyancing services as a result. Other law firms, however, have responded in kind by finally choosing to invest in infrastructural upgrades capable of competing with those alternative models. Particular emphasis is being placed on IT. Firms are continuing to push for infrastructure upgrades that ensure all staff members have secure access to case-critical information even when off company premises. Furthermore, new metadata technology is providing firms with higher predictability on costs, which means they have a more controlled grip on outgoing expenditures. As cultural shifts continue to press demand for IT-savvy services, law firms are finally battling to stay relevant. That’s bringing in more business, and it’s also cutting costs. Overall, the global law sector has enjoyed a profitable, albeit tough, 12 months. 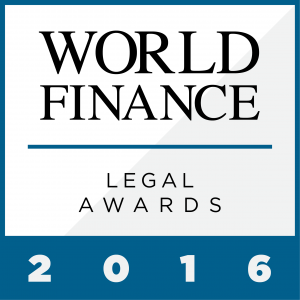 The World Finance Legal Awards celebrates the firms that successfully navigated this uncertain industry to achieve greater highs than ever.